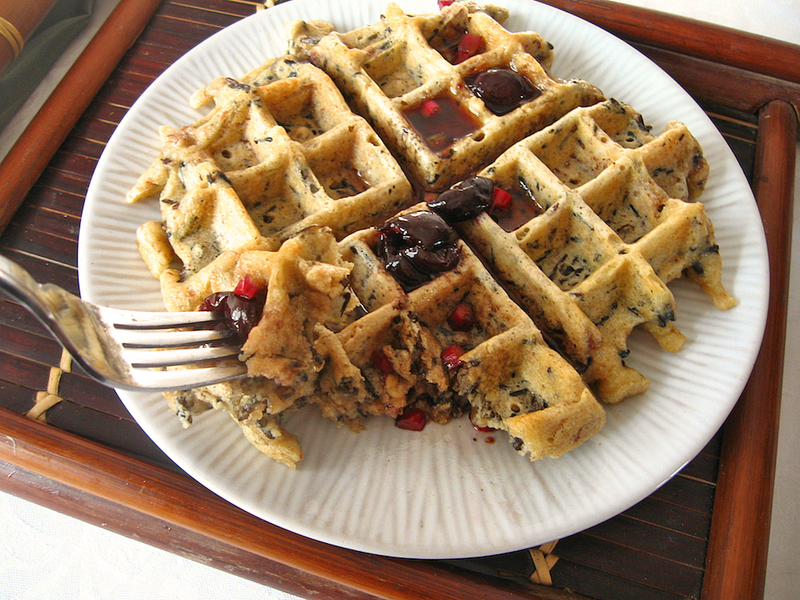 The prospect of wild rice, maple syrup, and rhubarb together on a plate enticed me to get my waffle iron out again. The resulting crisp, nutty waffles tasted wonderful on their own, but adding cherry-rhubarb maple syrup was a perfect complement to the waffles. Complex and hefty enough to be a stand-alone meal, I didn’t even miss having bacon. Never have I tasted a heartier waffle, so I highly recommend these for brunch, or when you are in the mood to enjoy breakfast for dinner. 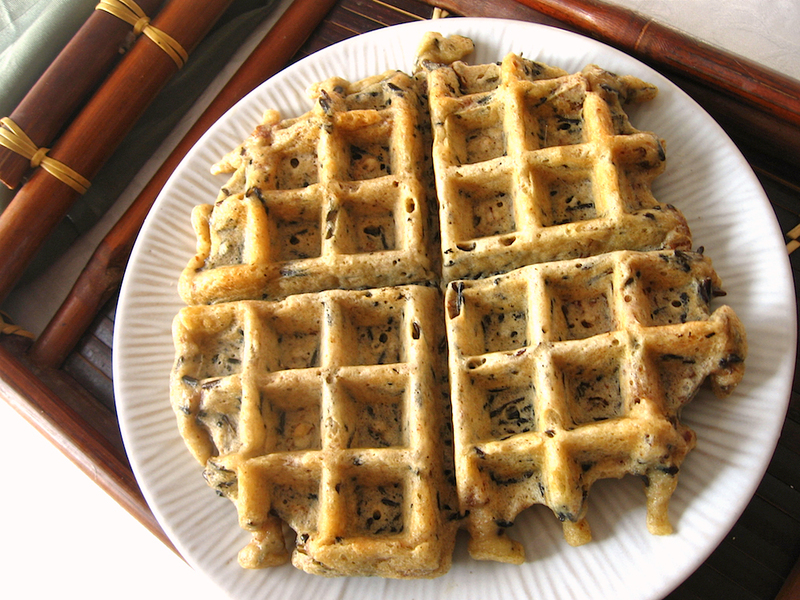 Now I have one more reason to wish my rhubarb would grow faster–so I can enjoy another batch of wild rice waffles! Whisk together flours, baking soda, and salt. In a separate bowl, whisk together egg yolks, almond milk, and butter or oil. Stir together wet and dry mixtures until just combined. Preheat waffle iron. Beat egg whites in a separate bowl until stiff peaks form. Fold egg whites into batter, followed by cooked wild rice and chopped pecans. Grease the waffle iron lightly with oil or butter and pour in batter. Cook waffles according to waffle iron directions, until golden and crisp on the outside and batter is cooked through inside. 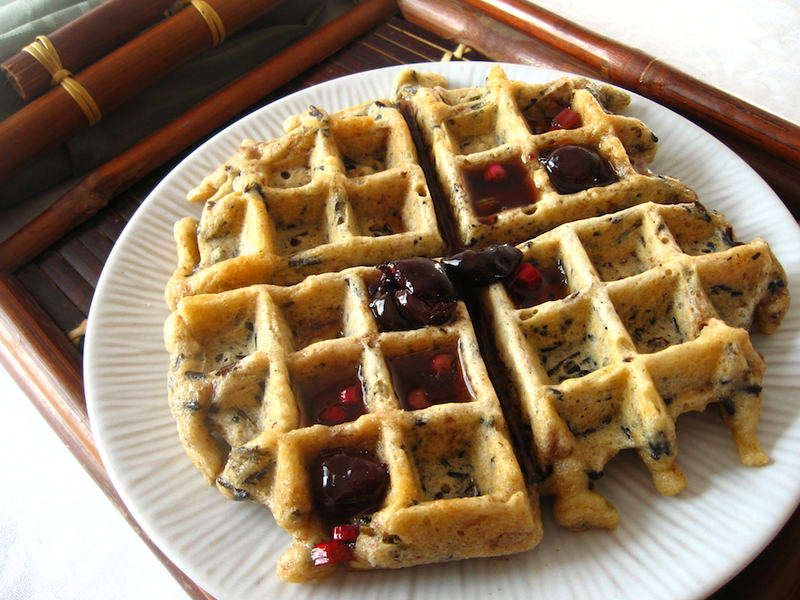 Serve waffles warm with pure maple syrup or cherry-rhubarb-infused maple syrup. **To prepare wild rice, bring 1 and 1/2 cups water to a boil. Add 1/2 cup dry wild rice and 1/4 teaspoon salt and reduce heat to simmer. Cover and simmer for 50 minutes, then drain wild rice and measure out 1 cup. Sounds really healthy and yum!! What a fabulous recipe, and I’m intrigued by the idea of rhubarb maple syrup! I love the different flavor combinations! And you can’t complain with something so good is healthy for you too! oh, what an interesting recipe. Does rice add flavour or texture? 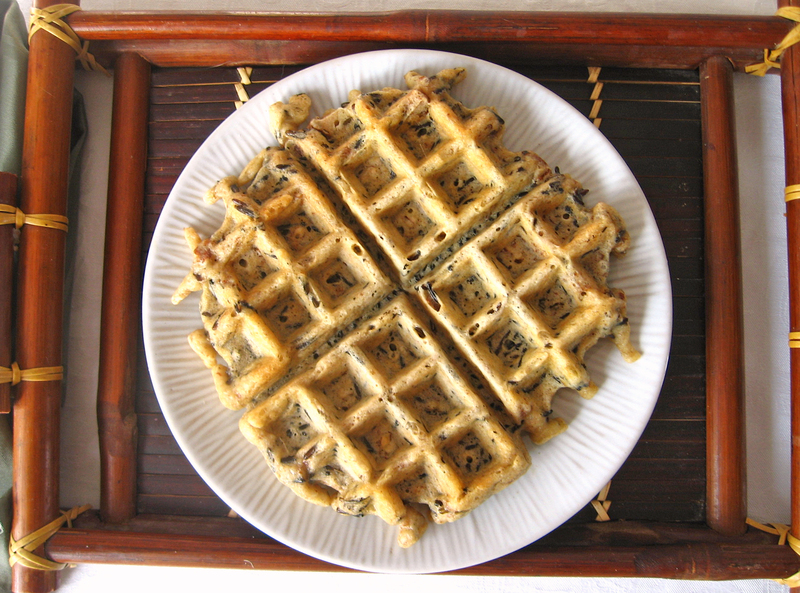 Wild rice adds both flavour and texture to the waffles. They’re quite unique! I’m going to play around with some savoury toppings the next time I make them. This would be a recipe to make to my brother-in-law when he comes over. What a nice combination of flavors, I’m sure he would love them. What a wonderful weekend brunch idea. I haven’t made waffles in ages but can almost taste these served with bacon and some rhubarb syrup. Thanks, Cathy. You can make them with unbleached wheat flour too, if you like. Enjoy! This is such a perfect way to start the day! I adore the flavors in these waffles! Love the sound of the cherry-rhubarb maple syrup too! Thanks, Kelly. I really do like rhubarb and maple together.